I’m a little late to the party with the Ride or Die Makeup Tag. 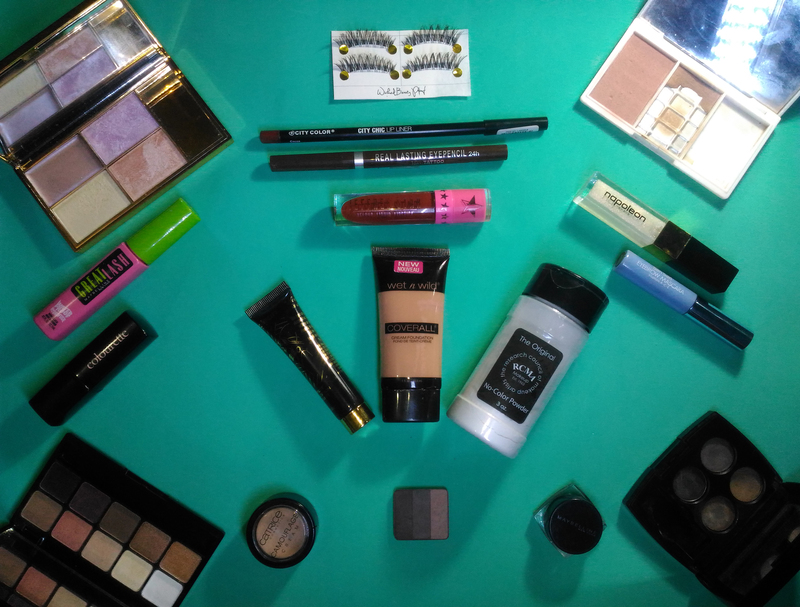 I’m always trying new products; so, my list of favourites is always changing. The year is coming to an end, and I decided that it’s about time I round up my favourites for 2016. Primer: Napoleon Perdis Auto Pilot Pre-Foundation Skin Primer – This is not the usual silicone-based primer. It has more of a lotion-like consistency. I love how it moisturizes my skin while providing a good base for my foundation. This works really well for my combination-dry skin. Foundation: Wet n Wild Coverall Cream Foundation – I love this foundation so much! It’s a medium-full coverage demi-matte foundation. It’s actually a liquid foundation. So, I’m not sure why it’s called a cream foundation. Anyway, the finish of this is just so flawless; matte, but not flat. It looks just like second skin. This sets well on my skin, so I don’t usually to powder over it. Concealer: Catrice Camoflauge Cream Concealer – This concealer can hide almost anything! I love this for hiding any traces of an all nighter. It’s very creamy and a little goes a long way. This does crease, though. So, a good setting powder is needed. Setting Powder: RCMA No Color Powder – I gave in to the hype when I heard Jacklyn Hill and Wayne Goss rave about this powder. Mind you, this is not cheap. Initially, I hated this because I packed it on like how I would with my other setting powders, and it highlighted my dry patches. However, I discovered that you really only need the tiniest amount of this powder; and, it looks phenomenal! So velvety smooth. Contour Powder: Inglot Freedom System Eyeshadow in “112R” – I don’t really use a specific contouring powder. I just use my Inglot eyeshadow which has 3 neutral shades of brown. Sometimes, I also use this for my eyes and brows. It’s very versatile! Blush & Bonzer: EB Blush and Bronzer Duo in “Baked Fig” – Can you tell from the photo how much I love the bronzer? It gives my face the right amount of colour without looking orangey. The blush is such a beautiful dusty rose colour. The neutral tone would suit any skin tone. I also love how just a little bit of product goes a long way. Highlighter: Sleek Solstice Highlighting Palette – This is the BEST drugstore highlighting palette that money can buy! I promise. The quality of both the packaging and the actual product just looks and feels so high end and luxurious. Brow Products: FS Eyebrow Powder Quad Palette & San San Waterproof Eyebrow Mascara – Now, I know that these are two products; however, I use them as a combination, which I would could as one. The FS brow palette is very versatile. The product is richly pigmented and easy to apply. The San San eyebrow mascara really sets your brows to a budge-proof, waterproof finish. This is legit. Eyeshadow Palette: Pink Sugar Eye Candy Eyeshadow Palette in “EC-02” – This palette is just perfect. Gone are the days when drugstore, local palettes were just the chalky, poorly-pigmented stuff. This palette is the real deal. It’s a close dupe to the Viseart Minx palette, if I’m not mistaken. This palette is all you ever need to take you from day to night! Eyeliner: Maybelline Lasting Drama Gel Liner & K-Palette Real Lasting Eyepencil – Again, these are two products; but, I do use different eyeliners for my top and bottom lid/lash line. I use Maybelline gel liner for my top because it stays put on my very oily eyelids. I use the K-Palette eyeliner for my very watery waterline/lower lash line. Mascara: Maybelline Great Lash Mascara – Ah. An oldie, but a goodie. This is my ultimate favourite mascara because it just WORKS. I have lashes that droop downwards. This holds my curl and gives me beautiful lashes. Falsies: Wicked Beauty False Lashes (style “G01”) – I was not a fan of false lashes until I tried Wicked Beauty! (No, I am not paid to say that.) They are just so affordable, but the quality is really good. Plus, they come in so many different styles! Lip liner: City Color City Chic Lip Liner – I used to hate lip liners because the ones I’ve tried were either stiff and dry, or too soft and mushy. City Color nailed it with these lip pencils. They have the right amount of firmness, so they don’t break easily; but, at the same time, they glide on really well on the lips and don’t dry them out. Lipstick: Colourette Cosmetics Colourstick in “Georgia” – Now, if you’ve read my review on Colourette lipsticks, you would know by now that I absolutely love them! I would choose them over Mac any day. My favourite shade would probably have to be “Georgia” because it goes with anything and everything. You just can’t go wrong with this shade. Lipgloss: Napoleon Perdis Lip Veil in “Rare Opal” – The formula of this lipgloss is smooth and hydrating. The shade I have is clear with beautiful pink, purple, and gold fine reflects. This looks amazing over any lipstick. Liquid lipstick: Jeffree Star Velour Liquid Lipstick in “Unicorn Blood” – HANDS DOWN, the BEST liquid lipstick formula I’ve ever tried! This is the only liquid lipstick that does not dry out my very dry, textured lips. The formula is just phenomenal. As for the shade, I live, breathe, and bathe in Unicorn Blood, which is a deep blood red. Plus, it smells like root beer! That’s all for my Ride or Die Tag/2016 Favourites!